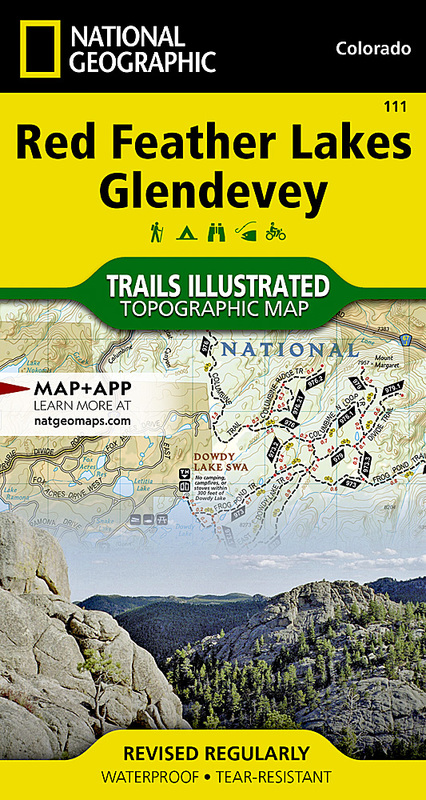 National Geographic's Trails Illustrated map of Red Feather Lakes and Glendevey provides unmatched detail of this mountainous area in north central Colorado. Expertly researched and created in cooperation with the U.S. Forest Service, Bureau of Land Management and others, the maps covers many popular points of interest including Roosevelt National Forest; Rawah Wilderness; Dowdy and Bellaire Lakes; Laramie and North Fork Cache la Poudre Rivers; and Hohnholz Lakes and Cherokee Park State Wildlife Areas. Let the map guide you off the beaten path and back again with clearly marked trails, bike routes, high clearance roads and four-wheel drive roads. To aid in your navigation of the area, the shaded relief map includes contour lines with elevations, labeled peaks and summits, water features and selected waypoints. Some of the marked recreation features are motorcycle and snowmobile trails, cross-country ski areas, fishing access points and campgrounds. Also provided are wilderness regulations, safety tips and essential contact information. Other features found on this map include: Rawah Wilderness, Roosevelt National Forest.